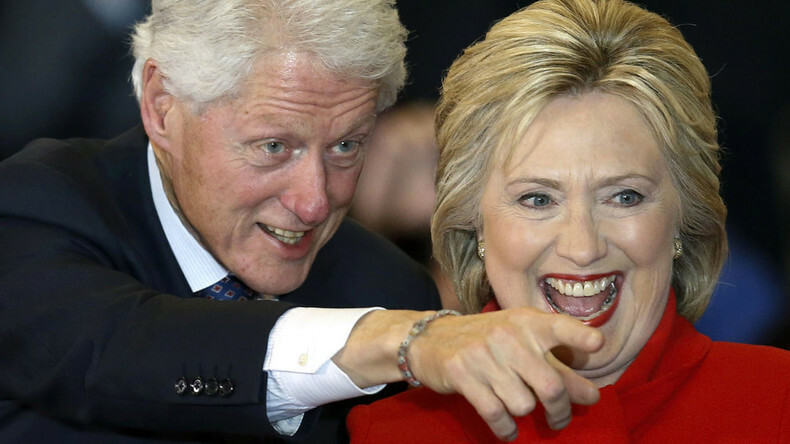 During what was supposed to be Hillary Clinton’s big day at the Democratic Convention she is getting the worst of it from Donald Trump, who is turning attention back on her alleged criminal activity, said former Republican Senate policy adviser Jim Jatras. Eight years ago, Barack Obama convinced Democrats he should be the party's presidential nominee, now he's trying to convince America Hillary Clinton should take over for him. Obama heaped praised on his former Secretary of State, saying there's no one more qualified to sit in the Oval Office. As protesters burned the US flag outside the Democratic Convention, showing their disappointment over Clinton's nomination, it is clear the US President’s sentiments for Clinton aren't shared by every Democrat. 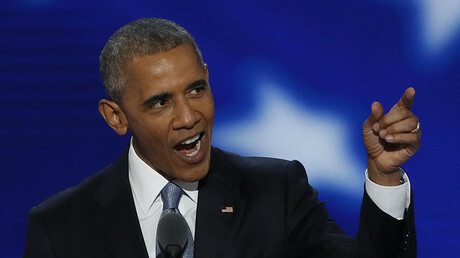 In his speech before the Democratic Convention, Obama lashed out at Republican candidate Donald Trump, accusing him of supporting Putin and praising Saddam Hussein. Jim Jatras, a former US diplomat and GOP Senate policy adviser, shared his opinions on the political intrigue. RT: Clinton's campaign is constantly blaming the Russians for any hacking attacks. At the same time, Trump is being pictured as Russia's close friend. How could that influence Trump's chances of becoming the next US president? Jim Jatras: Of course, they’ve tried to make… a supposed Trump relationship with Vladimir Putin and of course Trump says he has no relationship with Vladimir Putin. They’ve exchanged a couple of light compliments, it seems, but other than that there is no relationship. They are trying to tie it to this business of the hacked emails from the Democratic National Committee that showed that the process was rigged by the Hillary Clinton people against Bernie Sanders. And of course, Trump says there is no evidence the Russians did it. Maybe they did. Maybe the Chinese did, who knows. But if the Russians did do it, they probably have Hillary’s other 30,000 emails that she had on her private server. Let’s release those. And that is what is causing a real uproar right now. But I think Hillary Clinton is getting the worst of it. Here she is during the Democratic Convention, what was supposed to be her big day, and instead she is getting, as we say, ‘punked’, by Donald Trump, who is turning the attention back on her criminal activity in putting this classified information on a private server. So, it is really amazing how he is turning these charges against him around and ruining Hillary’s parade. RT: For the Democrats, Putin is nothing good, while Trump frequently refers to him in a positive light and the latest polls now put Trump ahead. Does that tell us anything? JJ: No, her record is horrible, of course. Remember, all Trump has said with respect to North Korea, Russia, China and so forth is: “I’ll talk to them.” What he emphasized today is “I think we can get along with Russia; in fact, we should get along with them so we can work together to defeat ISIS. What’s wrong with that?” And I think most Americans will agree with that. Meanwhile, you’ve got Hillary Clinton taking millions of dollars from the Saudis, money given to the Clinton Foundation, money paid to her husband in speaking fees from various repressive governments while she was Secretary of State, a lot of money the Chinese had given to her… Remember, this goes back to the 1990s with the whole Charlie Trie episode with the Chinese illegally funneling money to then President Clinton. She hardly has clean hands in all this. RT: Trump also suggested that, if elected President, he may rethink US sanctions against Russia and could even go as far as recognizing Crimea as part of Russia. Is there widespread public support for that? Chris Hedges, RT host: I actually don’t think Americans are that involved in what’s happening in Crimea and Ukraine. I think that is driven by a policy agenda that most Americans are not particularly aware of. And particularly the decision by the arms industry to push for the expansion of NATO, although of course, former President Reagan had promised Gorbachev that we would not expand NATO beyond Germany. I just don’t think that that minutia is high on the radar screen. Americans tend to be very uninformed about foreign affairs. Even about foreign issues that they should be focused on in places like Iraq and Afghanistan. CH: Russia and President Putin are regularly demonized, not only by US government officials, I think, to justify the expansion of NATO, but by the echo chamber in the corporate media. To the extent that they are aware of issue, it has been spun in such a way that is certainly different from the narrative that Donald Trump has proposed. 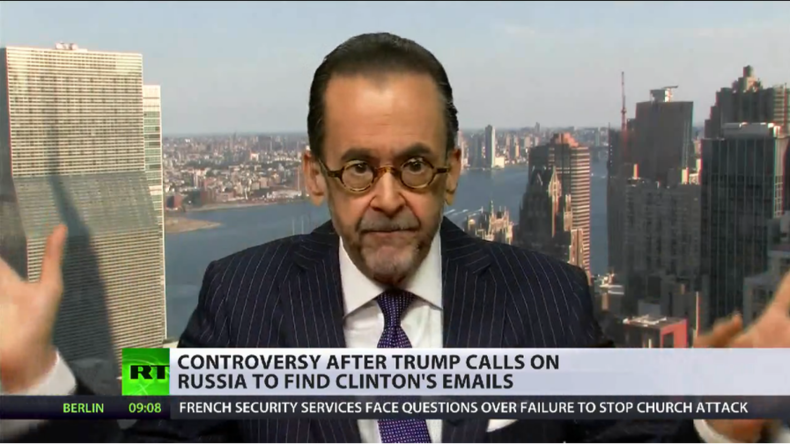 Legal and media analyst Lionel believes the focus of the US press on Trump's relationship with Putin is nothing but political theater. "What are we talking about? Russia, emails… So what [Trump] has done is, not only has he stolen the thunder, he has redirected it like a rodeo clown does, and redirecting the bull towards him, he’s also inspired everyone to take the bait and now reintroduce them to the very controversy that Hillary Clinton and the Democrats have been wanting to avoid… This is a chess move that is multidimensional. Sheer genius", he told RT.